Directed by Nicholas Meyer less than a year after the success of Star Trek II: The Wrath of Khan, landmark made-for-TV film The Day After (1983) still stands as the highest-rated production of its kind 35 years later. Developed by ABC Circle Films after the resounding impact of small screen productions such as Duel and Roots, the film's violent and unsavory subject matter -- in this case, a realistic portrayal of nuclear war and its fallout -- was passed on by three separate directors before landing in Meyer's lap. Despite his own reservations about its grim story (not to mention the idea of directing for television, seen as a giant step backwards in those days), the end result was a calculated, gut-wrenching production reportedly watched by roughly 60% of American television owners during its original broadcast. 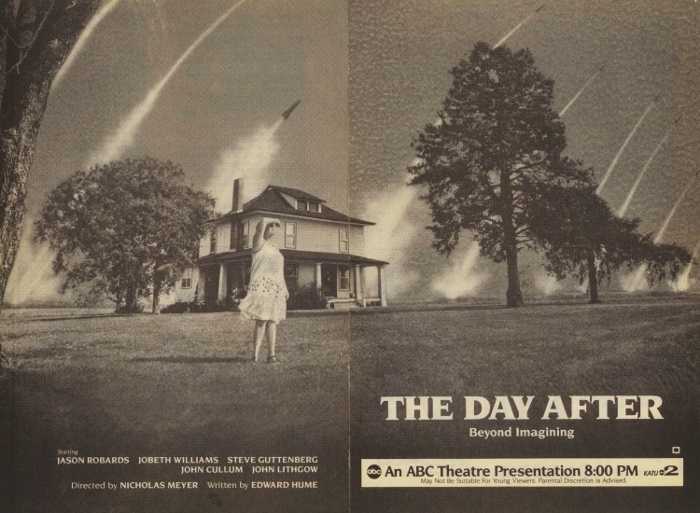 Originally conceived as a four-hour "event" shown over two nights, The Day After's ambitious scope was eventually cut in half...but even at a trimmed-down two hours further padded by commercials, advertisers quickly got cold feet about being associated with such a bleak and potentially disturbing production. Not surprisingly, even the final TV cut -- whose editing process took over six months, with Meyer leaving in protest during most of this time -- originally aired with a pre-show warning, while toll-free hotlines were even put in place to counsel any viewers bothered by its nightmarish imagery. 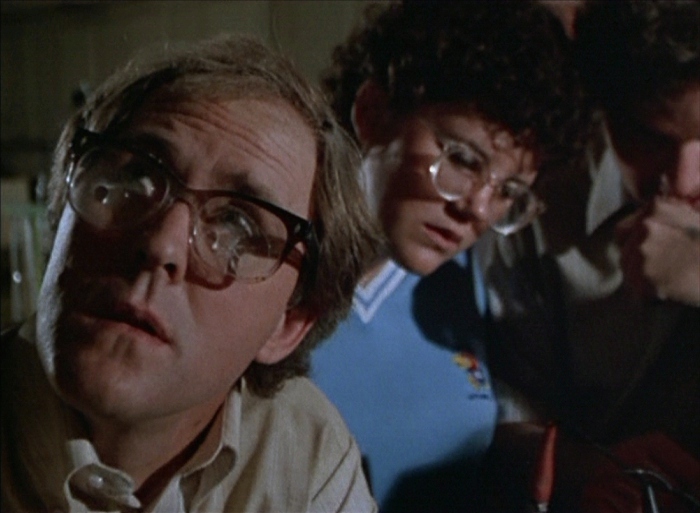 And while The Day After is technically a dense, character-driven production (the leading role is filled by veteran actor Jason Robards, with support from then-newcomers like JoBeth Williams, Steve Guttenberg, John Lithgow, Dennis Lipscomb, and Amy Madigan), Meyer insisted on understated performances and minimal music cues; otherwise, too much attention would've been diverted from its central nuclear conflict. And what a conflict it is, punctuated by a catastrophic event near the hour mark that divides The Day After into two distinct halves. Even before that, tension mounts in small bursts but life outside political circles feels as natural, peculiar, and unsettling as it might if such an event actually occurred. After that, all bets are off and The Day After shows much of the fallout in grim detail; even the TV cut, which removed several shots of charred bodies and other graphic visuals, packs quite a punch. Reportedly, Meyer pushed for even more realism but was flatly denied; not surprising, given the tighter standards of "decency" for networks almost four full decades ago. In recent years, Hannibal has gotten away with more. The Day After remains an effective shock drama that easily gets it point across, even though the stories of its effects on political policy may have been exaggerated. Those who didn't see the film during its original ABC broadcast were likely introduced via MGM's 2004 DVD, a barebones disc that only included the film's [European] theatrical cut. Fortunately for die-hard fans, Kino's new two-disc Blu-ray also includes that original 1983 TV cut discussed above: running about five minutes shorter, it shuffles around a few scenes and, again, trims some of the gorier post-apocalyptic imagery. They aren't substantially different, but it's great to have both versions of The Day After in one handy package. Like Kino's excellent Blu-ray edition of Hell in the Pacific, there's more attention to detail than your average catalog release. Though obviously sourced from different elements, both the TV and theatrical versions of The Day After (presented on separate Blu-rays in 1.33:1 and [mostly] cropped 1:78:1 format, respectively) look to be in great condition. These new 1080p transfers are quite impressive overall: both are clean and crisp with similar levels of image detail and texture, with an obvious edge going to the TV version since it's not "panned and scanned". Colors and black levels are different as well, with the TV version looking slightly cooler with more natural contrast in comparison. Overall, both Blu-rays offer a substantial improvement over MGM's 2004 DVD, so die-hard fans and newcomers alike should be very pleased. This Blu-ray's DTS-HD Master Audio mixes are presented in a split 2.0 mono spread with clear dialogue and sound effects for both versions. Though obviously limited by its source material in some respects, these are still very competent presentations that convey both the everyday and post-apocalyptic atmospheres as well as can be expected. The attack scenes are quite powerful, even while lacking the depth and presence of a newer film. Dynamic range sounds slightly different during each cut -- it's possible that the TV version was (rightfully) mixed for the small screen and vice versa, but the differences are negligible. David Raksin's score sounds great, rarely overpowering the dialogue and it's usually dropped in at just the right moments. Frustratingly, English SDH subtitles are only offered during the theatrical version on Disc 2. The static interface includes separate options for playback, chapter selection, subtitles, and bonus features, with quick loading time and minimal pre-menu distractions. This two-disc package arrives in a standard dual-hubbed keepcase with reversible cover artwork that utilizes promotional images from earlier home video editions and ads, including the one below. No inserts are included, promotional or otherwise. Just a few, but obviously a big step up from the barebones 2004 DVD. Disc 1 [the TV version] features two brand-new Interviews with director Nicholas Meyer (28 minutes) and actress JoBeth Williams (13 minutes) that collectively offer a solid amount of first-hand insight and retrospective stories. Main areas of discussion include Cold War paranoia, ABC's initial interest in the project (originally known as "Silence in Heaven") after the success of Roots, reading the script, meeting Jason Robards on an airplane, editorial disputes and leaving the project for three months, losing advertisers, censoring birth control, trying to lighten the mood on set, the recent possibilities of nuclear war, public reaction to the film, and much more. Meanwhile, Disc 2 [the theatrical version] includes a full-length Audio Commentary with film historian Lee Gambin and comic book artist/writer Tristan Jones; it's a second-hand track that's extremely enthusiastic but more than a little rough around the edges. Among other topics, the pair touch upon other made-for-TV movies of the era, politics past and present, supporting characters and shout-outs, the creative visual effects, and other post-apocalyptic films -- but there's a lot of rambling and very few smooth transitions. One technical flaw doesn't exactly help matters: the recording quality on this track is simply awful: Jones sounds like he's on speakerphone, while Gambin's mic level is too strong with slightly blown out highs. (It doesn't help that he speaks in all caps and dominates the track by a wide margin.) I'll admit that this was kind of a chore to sit through, especially in comparison to the excellent interviews on Disc 1. "Theatrical Trailers" (presumably for The Day After) are also advertised but nowhere to be found. 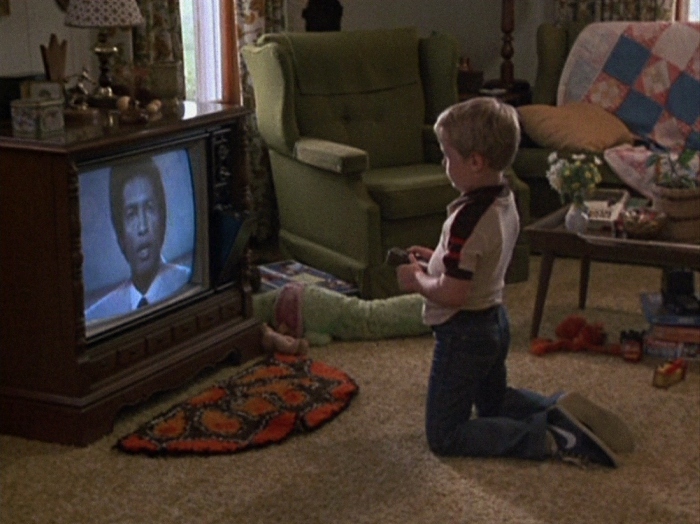 Nicholas Meyer's The Day After is an unavoidably tough watch, but it's one of the better apocalyptic dramas of its era (and believe me, there were quite a few). Featuring purposefully understated performances and music, Meyer wanted full attention on the central crisis -- so when it hits, it hits hard and doesn't ease up until the end credits roll. It's not exactly ideal date night or family material, but The Day After has aged surprisingly well and can be considered a career highlight for almost everyone involved. Kino's Blu-ray is another winner: offering a great A/V presentation, both cuts of the film (including the TV version, which debuts on disc here), and a handful of mostly good bonus features, this is a nice step up from MGM's 2004 DVD and absolutely worth a purchase for fans and newcomers alike. Highly Recommended.